A collection of a thousand informative, educational, and sometimes amusing quotations. 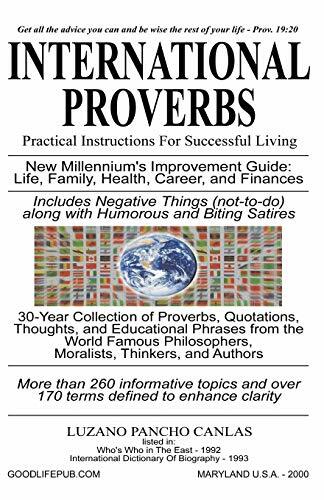 This is an easy-to-read collection of proverbs and words to live by: from ancient times to the present. Gathered from around the world as well as from the Bible, it is hoped they might guide everyone in achieving contentment, joy, and prosperity in this world. In 1968, the author found that his hobby for killing time and avoiding boredom -- reading, then taking notes for future reference -- had become an 'addiction'. Eventually, it became this book. In 1992, when he managed to copyright six books in 12 months, the staff at the Library of Congress recommended him to be included in Who's Who in America. His most recent book, "Philippines: A 2 Millennium History" is also available through Buy Books On The Web.com.